Why do some wheat dough balls rise well and bake into perfect loaves while others are flat and hard as a brick? A new study says it’s as much about the flour as the yeast. That was the conclusion of Mathieu Meerts, a chemical engineer at KU Leuven, a university in Belgium, and his collaborators. He presented the results of their experiments on how gluten and starch affect how dough behaves last week at the annual meeting of the Society of Rheology in Baltimore, MD. Rheology is the study of how materials deform and flow — think the oozy viscosity of syrup or ketchup, or how bread dough deforms when you punch and knead it. That said, there’s a lot scientists don’t know about the squishier aspects of dough. “Our scientific understanding of bread making is still surprisingly limited, especially when we consider that mankind has already been making bread for several thousands of years,” Meerts told Gizmodo via email. Conventional wisdom holds that good yeast is the key to the perfect loaf. It’s certainly a critical element. But any experienced baker will tell you that there’s a lot of variance in wheat flours, which is why the food industry has developed a battery of tests to determine the quality of flour. Meerts et al. were more interested in learning about the resulting dough’s internal structure, which (as with all materials) determines its properties. Bakers in ancient Egypt used to test bread dough consistency by the time-honored tradition of rolling it in their hands. But it is difficult for non-professional bakers to feel significant differences in the dough’s gluten network just by kneading it. So you can’t tell with absolute certainty which would produce a perfect loaf and which would just fall flat. Meerts is not a food scientist; his lab studies polymers and how they behave under stress via stretching. Bread dough is much more challenging to work with in the lab, given all the variables that can affect the measurements: small temperature changes, enzymes reacting with the flour, or dehydration, for example. But over several years his lab figured out how to control the material sufficiently to get solid measurements. First, they set out to determine whether the gluten network was the most important factor in whether or not a ball of dough produces a good loaf. They stretched pure gluten — which behaves much like dough samples under stress — by attaching each end to one of two small cylinders. One cylinder stayed in place and the other moved around it (much like the moon orbits the Earth) while simultaneously rotating around its own axis, stretching the dough in the process. The experiments showed clear differences in the way doughs made with different wheat flours responded to stretching. And gluten did indeed seem to be the primary factor. Next they questioned whether there was some way to tweak the gluten network to improve the quality of a sub-par wheat flour. The ideal gluten network for bread dough needs to be strong enough to withstand all the carbon dioxide produced during fermentation, which leavens the dough. But it must be sufficiently flexible so that it can expand with those gas bubbles. Too stiff a gluten network in the dough equals flat bread. 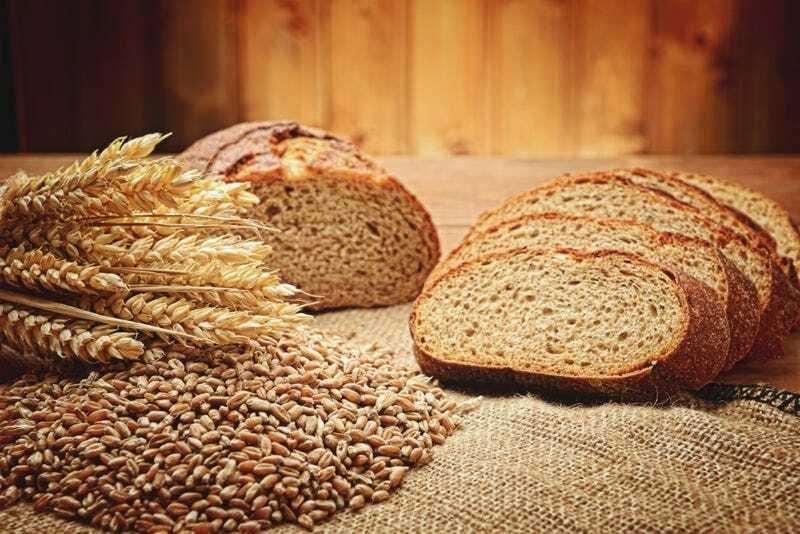 Both gluten quantity and quality must be taken into account when assessing whether a particular wheat flour will rise to the bread-making occasion. The quality is determined by the ratio between short chain and long chain gluten proteins in the flour. More long chain molecules means stronger, more stable dough. Meerts and his colleagues didn’t get to actually eat any yummy loaves of bread after all that work. Apart from strict laboratory safety protocols, they were working with relatively small samples, which produced equally small loaves that, he admitted, weren’t particularly tasty, or visually appealing. “Still, entering a lab filled with the smell of freshly baked products every morning is certainly a good way to start your day,” he said. Image credits: (top) Scorpp/Shutterstock. (bottom) Starch particles in a gluten matrix. Credit: Mathieu Meerts. Herh, Peter K.W. et al. (2000) “Rheology of foods: New techniques, capabilities,and instruments,” ATS Rheosystems. Meerts, Mathieu et al. (2015) “Redefining the role of the gluten network in the rheology of wheat dough,” Society of Rheology 87th Annual Meeting, October 11-15 2015, Baltimore, MD.